Ever since making the switch to Ableton, especially for when I perform, my life has been generally more positive (at least that’s what I think). The ease and convenience of the program just seems like a natural ebb and flow while I make and perform my music. It was one of our favorite DAWs mentioned in our best music production software article, specifically for live performances. 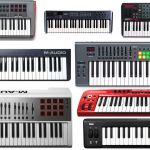 When it comes to music equipment, we love our MIDI controllers (especially keyboards). If you’ve just purchased Ableton or have been using it for a while and have decided that it’s finally time for an investment in a MIDI controller (as it is merely the basis of Ableton and a lot of it’s features), we’ve compiled just that for you. The exact best MIDI controller for Ableton Live depends on what you exactly want, especially with Live 9 remaining in full effect. Do you want a made-for-Ableton piece of gear? Just a drum pad? Perhaps a keyboard with keys? Both? We’ve listed the top best MIDI controllers for Ableton Live, sorted by our preference. 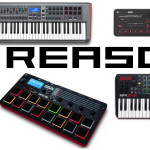 For more specific-types of controllers, check out our best MIDI pad controller write-up or the top 10 best MIDI keyboard controllers post. If we had to choose our absolute favorite controller for Ableton, we’d probably go with this if budget and type weren’t a factor in your decision. What’s unique about a lot of Ableton controllers out there are the made-for-software collaborations, and here they’ve paired up with Akai Professional — one of our favorites, ever. One of the biggest advantages you have when grabbing this is the visual feedback — the controls match Ableton’s layout so you can easily envision what you’re doing. Here’s a cool video of the APC 40 Mk2 in action. 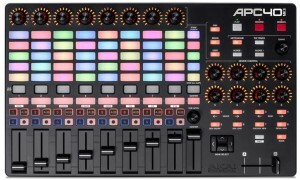 It’s got plenty of pads (5×8, and they’re a bit small but you’ll get used to them), 8 channel faders, a master fader, and 8 device controls that map flawlessly with the software. It’s USB-powered so you plug it in and you’re good to go. 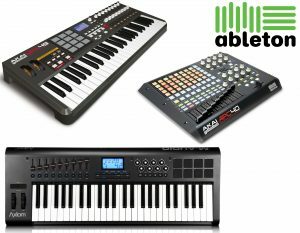 It has everything except keys, so that’ll be the only drawback but if you’re looking for an Ableton controller with keys continue down our list and they have those options as well. You can read our APC40 mk2 review for more info or click the pic for some price checking. You can also look at their APC Mini for a smaller, compact version that’s a bit cheaper. To take an even step further, here’s Ableton’s hand-crafted piece of music equipment. Considered the grandfather of all Ableton controllers, this is the machine that has been built by Ableton themselves for live playing capabilities (although it always pertains to recording as well). The only drawback here is the obvious retail price of around 5 Benjamins. We’ve also heard of people pairing this with a MIDI keyboard (if you can afford it). We know the price is a lot, but here us out in the features first: this thing has 64 pressure-sensitive\velocity multi-colored pads. You can mess around with loops, trigger and rearrange ideas whenever you feel like it. There are also 11 touch-sensitive encorders for even more custom-warping of your tunes. It comes with Ableton Live 9 Intro so that’s a huge plus if you don’t have it yet, although you’ll have to pay a few more dollars to upgrade to the full version. It’s not the typical keyboard keys, but if you can adjust to have all these pads, you can do some crazy stuff. There’s a video embedded below to check it out. It’s extremely compatible with Ableton, pairing flawlessly with the software (I mean they made it, right?). If you can afford this, it’ll take your live performances and studio-type work to another level. It’s up to you if you think it’s worth the 5 bills, but it is an investment that will last you many years and it’s one of the most recommended Ableton controllers in the market. Now we start to get into the MIDI keyboard territory that aren’t necessarily “made for Ableton” but work quite well if you’re looking for keys specifically. One of the best MIDI keyboards in terms of build, the MPK2 series are beasts. You’ve got a great option with both a traditional keyboard and drum pads. There’s 12 drum pads (great MPC quality, some of the best pads on a keyboard), 8 faders and knobs, and sweet DAW incorporation from the LCD screen. 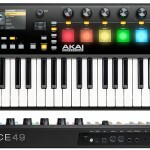 A better quality MIDI controller and keyboard for Ableton. If you can afford it, you can’t go wrong with an MPK. For something cheaper, check the key versions available. This is the cheapest MIDI controller for Ableton that is worth mentioning. 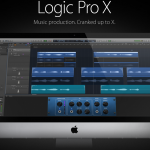 It’s got 8 assignable kobs, 9 assignable sliders to control your DAW and VST’s. It’s bus powered so you don’t have to hassle with an adapter. 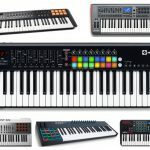 Just a standard MIDI keyboard, but we really like this one if you’re on a budget and need a keys only type of device for controlling MIDI in Ableton. M-Audio has always been a solid maker of music equipment. Here’s another keyboard and controller combo. 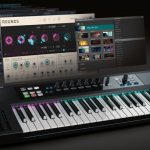 We’re big fans of Novation‘s music equipment and love this one because it’s a bit nicer than previous MIDI keyboards for Ableton besides the MPK. The keys are a better make than others with semi-weighted and aftertouch. 8 knobs, 9 faders with DAW and plug-in control. 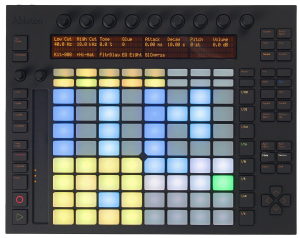 The drum pads are nicer (not quite as nice as the MPK MPC pads), and it also comes with Ableton Live Lite in case you don’t have it yet and want to try it out. plus it comes with a few synths and sample packs as well.